The primary way this will happen, figures student President Karl Nacalaban, is through events planned and implemented by the Associated Students of Washington State University Spokane (ASWSUS), which suits Nacalaban’s outgoing personality just fine. 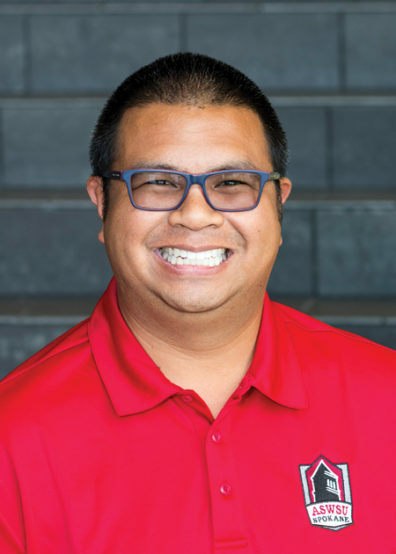 “Spending time at events working with and talking to other students and bringing people together is the most fulfilling part of this job for me,” Nacalaban said. His signature green and blue glasses are indicative of both his sociable demeanor and his passion for the Seattle Seahawks, where he previously worked in marketing. Nacalaban, left, was busy at the beginning of the semester recruiting other students to serve on various committees and get involved. 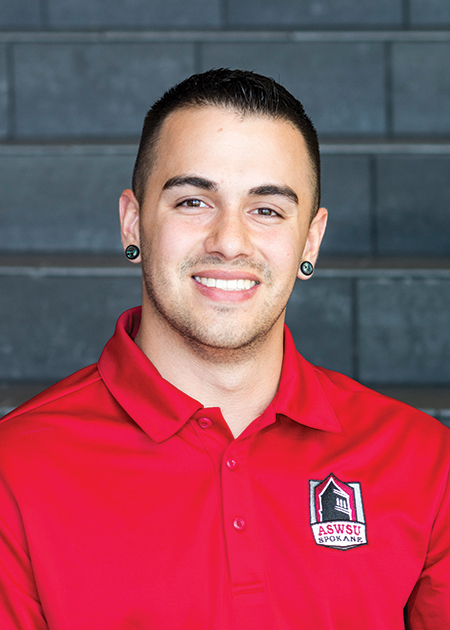 Nacalaban served as the ASWSUS vice president last year and inspired his running mate and the now-vice president, Alec Sisneros, to become involved. Sisneros worked as a student photographer last year while in his first year of pharmacy school and as a result he attended a lot of different campus events. After meeting and talking with Nacalaban, Sisneros decided he liked the idea of helping to create more interprofessional events this year. 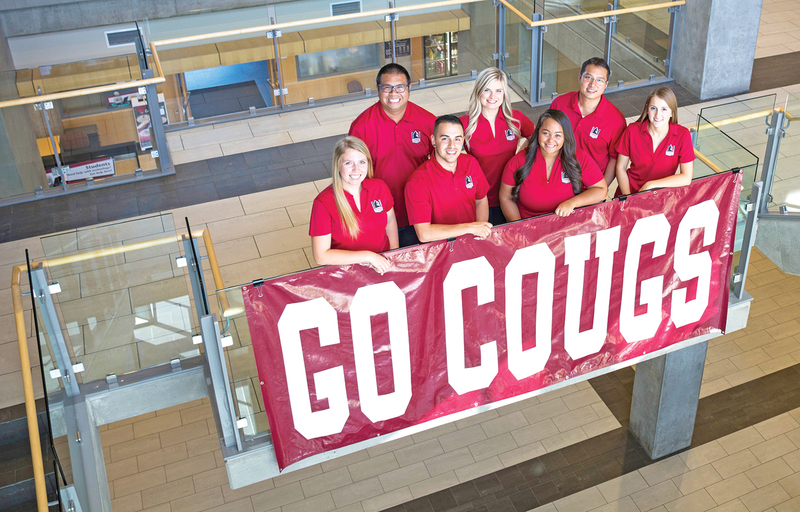 Sisneros, right, is from the Denver suburb of Littleton, Colo., and had never been to Washington state until February 2015 when he came to interview at the WSU College of Pharmacy in Spokane and loved it. Sisneros got his undergraduate degree in biology with a minor in chemistry at the University of Colorado at Boulder. He had excelled at both those subjects in high school and became interested in pharmacy because an addiction in his family inspired him to learn more about drugs. Nacalaban is a third-year pharmacy student and will be off campus next year for the clinical rotations that make up his fourth and final year in pharmacy. After getting a bachelor’s degree in chemistry from the University of Washington he found himself working in marketing for the Seattle Seahawks. While that was fun, he started looking around after about four years at how he might combine his interest in sciences with his love of working with people. Pharmacy is the perfect combination for him. Nacalaban is from Seattle and showed an interest in student body politics in high school but lost his one and only bid for student body president. He didn’t seek an office during his undergraduate years at the UW but when he arrived at the WSU campus in Spokane he saw an opportunity to contribute. Thai Dang, hometown Bellevue, Wash., studying pharmacy, serving as chief of staff. Christopher Pedersen, hometown Medford, Ore., studying Health Policy & Administration, serving as director of Legislative Affairs & Outreach. Megan Strom, hometown Clatskonie, Ore., studying nursing, serving as Student Entertainment Board (SEB) director. Tiana Bennett, hometown Spanaway, Wash., studying speech-language pathology, serving as SEB activities coordinator. Jessica Hagel, hometown Lakewood, Wash., studying pharmacy, serving as SEB performances coordinator. Janae Rame, hometown Sammamish, Wash., studying pharmacy, serving as SEB PR/marketing coordinator.